Learn to surf, try the new craze coming from Hawaii, Stand Up paddle Boarding is the perfect exercise remedy, learn the basics here! This experience is the perfect introduction to stand-up paddle boarding – the hottest new craze from the beaches of Hawaii. Although surfing and kayaking have long been a favourite among adventure seekers, even a basic understanding will equip you with all the basic knowledge and skills you'll need to get you underway this new watersport. Stand-up paddle boarding may be newer to hit these shores, but is no less exciting. Be among the first to try it out, master the basics and even get fit in the process. Don't worry, even the most unbalanced of people will quickly be able to gain confidence in this thrilling, yet relaxing new watersport.Once you have arrived and been welcomed to the Lagoon Watersports centre in Hove, your day will begin with a safety briefing covering the water and the new experience you will be trying your hand at. 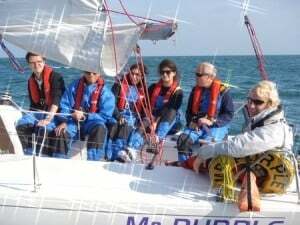 All of the equipment is provided by the centre, so all you need to do is turn up and get ready for some fun on the water! You will not be ready to hire boards after this introductory paddleboarding lesson, but you will be suitably ready to begin your Level 1 course. Throught the session, you will learn to the art of kneeling and standing paddleboarding, as well as basic turning and paddling techniques. On top of the useful skills you will be learning, you'll also have a fantastic time in the water, and may even improve your balance in the process! The Hove Stand Up Paddleboarding Introductory lesson is available all year round, subject to availability. Please call us for specific dates. This SUP boarding experience is aimed at complete beginners. Non-swimmers should notify the centre before making a booking. The entire experience will last for approximately 2 hours, including a full safety briefing and introduction to the equipment. 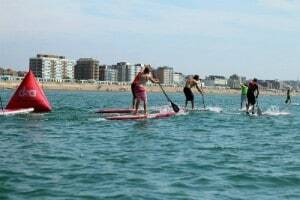 Participants: The Introduction to Stand Up Paddle Boarding Brighton is for 1 participant. Spectators are welcome to watch from the centre. There is also a licenced cafe for drinks and light refreshments. Please wear an old pair of shoes which you do not mind getting wet - don't forget a towel and swim wear. This Paddleboarding Introductory session in Brighton generally runs in all weathers. Should the experience be cancelled due to extreme weather conditions, the centre will offer alternate dates. My friend and I took part in the SUP experience and it was so much fun! The instructor was super friendly and gave us the option of lots of games to play to test our stability on the board! The experience was so much more than I expected and I would definitely go back for round 2! Had a fantastic day trying out stand up paddle boarding, was a great laugh and fab customer service!! It can be daunting to try out a brand new activity, especially a skilful one. But as the saying goes, ‘You’ll never know until you try’! At first, I was extremely nervous about stand-up paddleboarding (more commonly known as SUPing). The majority of my family and friends know me as one of the clumsiest individuals alive, so the prospect of balancing on a piece of polystyrene while drifting across the water didn’t exactly strike me as easy, but I was more than up for the challenge. On the mild afternoon of July 11th, we set off to Hove Lagoon where the experience was to be held. Lagoon Watersports is a Brighton based outdoor water sports centre offering activities including jetskiing, sailing, and windsurfing. They have two locations in Brighton: Brighton Marina and Hove Lagoon. The Lagoon was easy to get to, located alongside Brighton seafront when entering the Hove area. The lake was larger than I anticipated, with a children’s pool, and a clear glistening lagoon occupied by people taking lessons and enjoying the activities. I instantly spotted a stand-up paddle boarder and felt my excitement grow. We made our way into the reception area situated inside the Lagoon Watersports main building (which you can see photographed above). The staff were incredibly welcoming, and were quick to get us signed up before sending us off to the changing rooms. Katie was our lovely instructor for the day, and assigned us all with wetsuits. By the way, be ready for a battle with your wetsuit – although thick and warm, it does not make for a simple slide in job! Myself, Gemma and Hannah, who was on work experience with us, glamorously – or as glamorously as we could - strolled down towards the lagoon edge. Here, we were given instructions by Katie on how paddle boards operate, and how to position ourselves onto the board. Once we all understood what we were doing, we chose our paddle boards. There is a choice between a harder, more stable board, or a soft, inflatable board. To get into the water, we all laid out (tummy first) on top of our boards, and used our arms to glide gracefully into the centre of the lagoon. Now, for the tricky part! Katie helpfully assisted us on how to stand up steadily on the board, and lo and behold, no one (including me) fell off! Gemma took to paddling like a duck to water, while Hannah and I took a little longer to get to grips with the new balancing sensation. While I was becoming more confident, Hannah toppled straight into the water, and so did Gemma! However, my pompous satisfaction was short-lived thanks to a game of ‘Katie Says’ (a take on ‘Simon Says’) when I plunged headfirst into the water. After Katie gave us a few more tips and techniques, we finished with a game of Gladiators. The aim was to wobble the other person off their extra-large paddle board. Gemma and I tried our best, but Hannah came out on top as our well-deserved winner! After my day at Lagoon Watersports, I can confirm that Stand up Paddleboarding is brilliant fun, and people of all skill levels can give it a go and enjoy the experience. A huge thank you to the team at Hove Lagoon for having us!